My offering for today comes after a short break. I must confess I haven't felt much like creating although I have a few new stamps I'm anxious to play with. 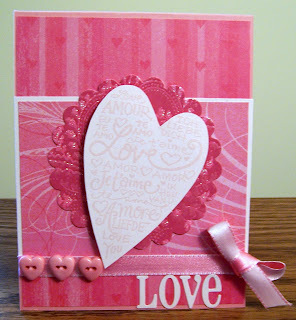 This card features the "Love Languages" stamp by Stampendous. The specialty cardstock by K&Company (a favorite craft company of mine) is called "Smitten" and it's a nice assortment of Valentine inspired designs. I used my Quickutz tool to cut the letters out and added a bit of ribbon. Voila, my Valentine's Day greeting is complete! I wish you could see, more clearly, the stamped image--it's embossed! To achieve the embossed effect, I stamped the image with Versamark and sprinkled clear embossing powder over it. Applied heat and the magic appeared.